Wavosaur is a free sound editor, audio editor, wav editor software for editing and recording sounds, wav and mp3 files. Wavosaur supports basic audio editing (cut, copy, paste, etc. ), plus has features for creating audio loops, analyzing audio and doing batch processing.Wavosaur supports VST plugins, ASIO driver, multichannel wav files, real time effect processing. The program has no installer and doesn’t write in the registry. Use it as a free mp3 editor, for mastering, sound design. 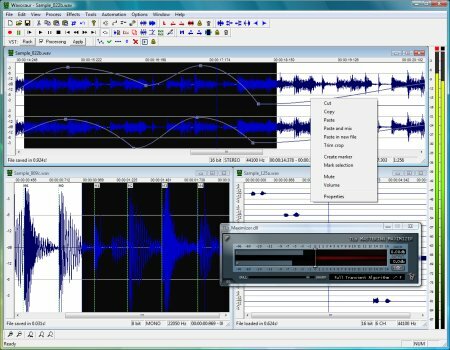 The Wavosaur freeware audio editor works on Windows 98, Windows XP and Windows Vista. If you’ve used Wavosaur, leave a comment with your thoughts. A question for anyone who has used this — I’ve been using Audacity for a long time – how does this compare? Why would I change from Audacity?